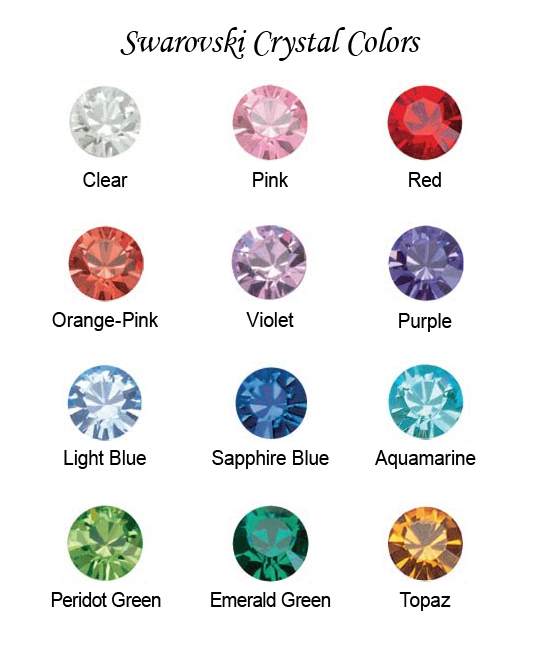 Select 1 of our 11 Swarovski Crystal Colors: Clear, Pink, Red, Orange-Pink, Violet, Purple, Light Blue, Sapphire Blue, Aquamarine, Peridot Green or Topaz. Please Note: Even though the Aquamarine Swarovski crystal color has the word "Aqua" in it, the Aquamarine crystals are NOT a true Turquoise (Aqua) color. The Aquamarine crystals are Greenish-Blue but look more like Light Blue crystals than a Turquoise (Aqua) color. If your wedding color is Turquoise (Aqua), we suggest that you select the Clear crystals because they look elegant with all wedding colors!